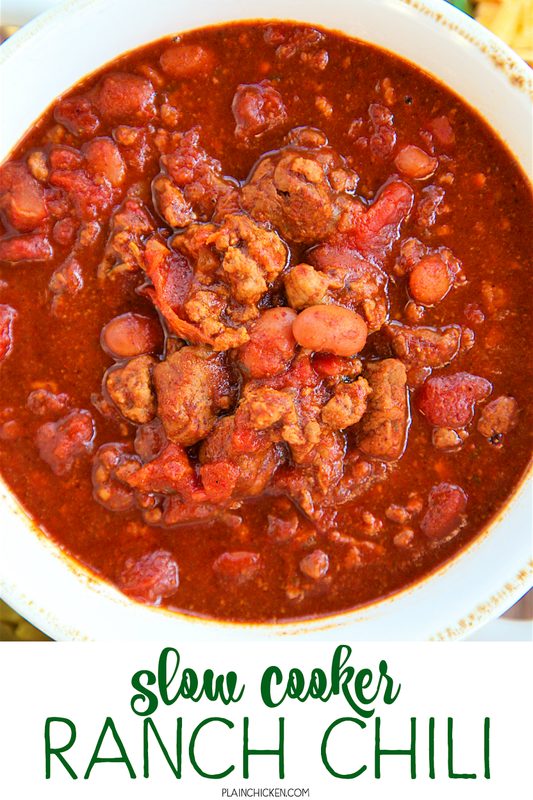 Slow Cooker Ranch Chili - THE ULTIMATE chili recipe!! Ground beef, stew meat, diced tomatoes, Rotel tomatoes, chili beans, beef broth, tomato paste, chili powder, cumin, garlic and Ranch dressing mix. 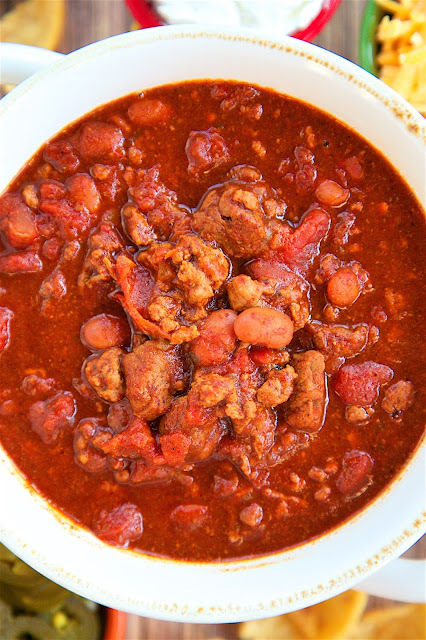 This has all the best from all of my chili recipes. It is the BEST chili recipe! Great for a crowd! Serve with some cornbread for a quick and easy meal! 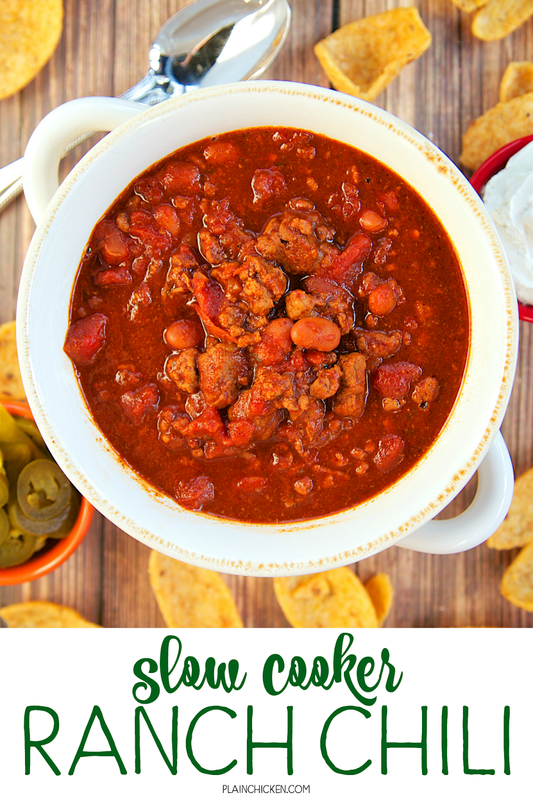 This recipe for Slow Cooker Ranch Chili combines a few of my favorite chili recipes. I basically took what I loved from each recipe and put it into one awesome recipe! It is the ULTIMATE chili recipe!! This chili has two types of meat - ground beef and stew meat. We loved the combination! There is a little kick to the chili from a can of Rotel tomatoes. Make sure to use mild Rotel tomatoes if you are sensitive to heat. We didn't think it was spicy, but I know some people might. 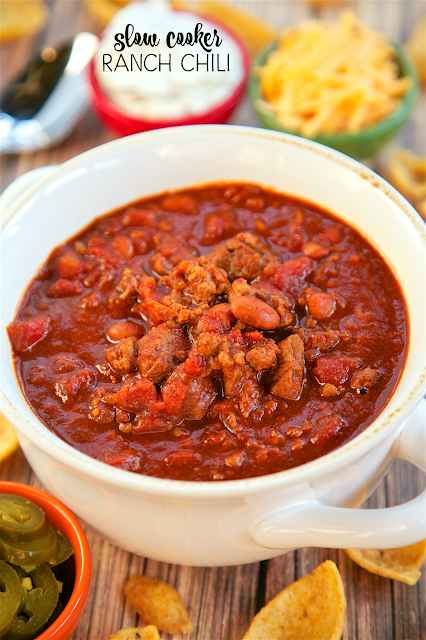 This Slow Cooker Ranch Chili might be the best chili we've ever made. It was SOOO good! It was even better the next day for lunch. We love to top the chili with corn chips, cheese, sour cream and jalapeños. Serve this with a nice pan of Southern Cornbread for a quick and easy meal! In a large skillet over medium heat, cook the ground beef until no longer pink. Drain fat and add to slow cooker. In the same skillet, cook the stew meat just until browned, about 3 or 4 minutes. Add to slow cooker. Add remaining ingredients, cover and cook on LOW for 8 to 10 hours. If you go to your store and look on the aisle with canned beans you'll see Chili Beans on the label. Don't know exactly what type of bean it is but the words Chili Beans will be on the label - just like Pinto Beans, Kidney Beans, etc. is on labels. 1. 1/4 CUP of chili powder?? 2. wouldn't chopped onion and minced garlic be better than powder? I also add 1lb of elbow noodles to my crock-pot while cooking.. really good and filling. I serve with saltine crackers. Keep the recipes coming, I love it/them!! I have a chili mac recipe on the blog. It is a good recipe as well. I cook for two and was wondering how well this would freeze for later if we did not want to eat all at one time. It would freeze great! We freeze chili all the time. Thanks for info. Now I can get to cooking...I added a few bell peppers just because I like them more than anything. Is the heat level pretty high with 1/4 c. chili powder? We are kinda wimps about heat. Personally if you are not real tolerant to heat, you would want to calm it down but I like the taste as it is but it does have some heat. I do not know what you would replace or change but it is a "hot" chili with this amount. We didn't think it was hot. This is a HUGE pot of chili. It won't have much chili flavor with less chili powder. Make sure to use mild Rotel in this if you are sensitive to heat.